Seasons are a changing and one of the brands that has been a regular feature of the site for sometime in Salomon. I’ve been reviewing their products for a number of years and they are one of the main leaders in progressing the sport of trail running, both from a product, but also community perspective. Below are a few highlights from their Autumn/Winter range, including links (click the titles) if you want to find out all the details. I tested the S/LAB Sense 6 SG (Soft Ground) a while back and they are light and responsive, yet capable of gripping to technical terrain and open fell. The drop is minimal, the construction light and the midsole aimed towards a fast cadence and efficient footstep. For this winter they have reduced the weight even more (how light can they go?! ), optimised the outsole lugs, integrated the sock liner and reduced the heel counter to be minimal. If you’re looking for a race bread, minimal, stripped back speed machine, these could be for you. Talking of speed….. Now, I can hear some of you already flexing your fingers, ready to type “this isn’t a new shoe for this winter” and, you would be correct. However, when things get really sloppy, you want to get into the mountains, off well cut trail, you need a gnarly shoe. The fact its black will help you, as they aren’t going to resemble a bright colour after 5 minutes in British slop. Well, until you wash them. The tread is deep and wide open, to maximise self cleaning (shedding mud), a large rand at the front protects toes and the outsole is constructed from Salomon’s Premium Wet Traction Contragrip®. If you want to take on runs like Ricky Lightfoot, look no further. You want grip and dry feet? The Speedcross 4 GTX® could be your choice. A popular shoe on trails, for winter the Speedcross has the addition of Gore-Tex® or GTX®. This waterproof membrane allows your feet to breath, whilst preventing rain from entering. Of course, don’t go submerging your feet in rivers, as there is a hole at the top for your foot! With a higher heel/toe drop then its out and out race siblings above at 10mm, this will suit a broad range of runners, with varying gates and efficiency. You may remember I loved the Sense Ride for summer running. It has become something I wear running, around town, in the office, everywhere. The winter version offers that same 8mm drop and Vibe Midsole, combined with Gore-Tex® Invisible fit to keep your feet dry, while feeling like a normal mesh shoe, rather than a liner. If you want to escape to the trails after work, or steer clear of roads at the weekend, the Sense Escape delivers enough grip to take on local trails, combined with greater comfort and an action that won’t punish heel strikers. 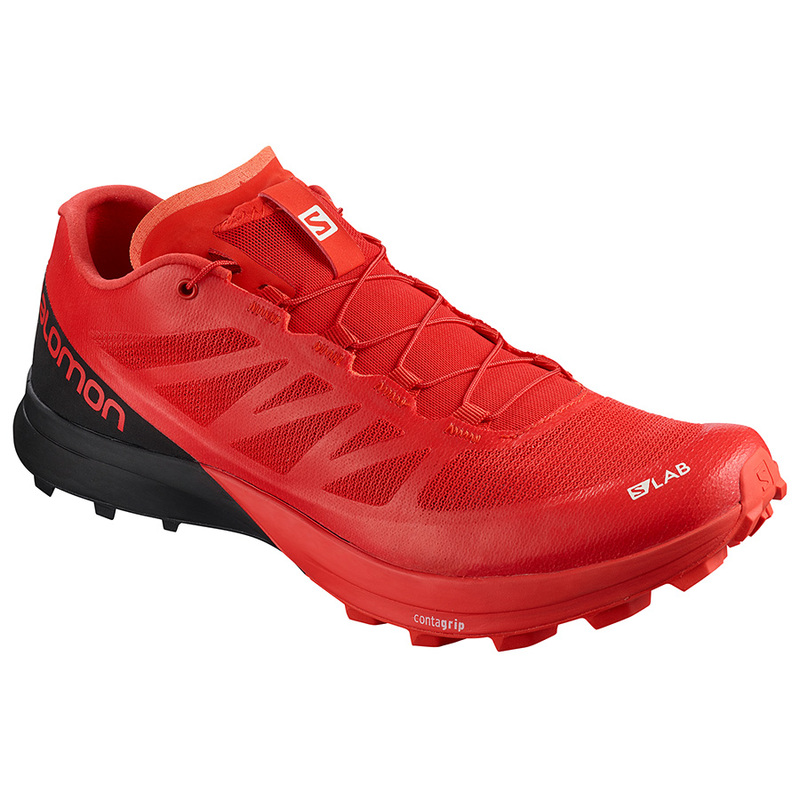 Given it’s going to be dark and wet a lot of the time, Salomon have come up with solutions for both. Back is the waterproof liner from Gore-Tex® to keep the rain out and despite being a dark shade, 360° reflective details cover the Sense Escape to keep you seen when tackling the urban jungle. No one likes getting cold wet and miserable in winter. It was a rain storm on a 10km run earlier this year which took me out for weeks. The Bonatti Race meets race requirements, with a 10K hydrostatic head & 10K breathable. A close fitting hood, partially elasticated hems and cuffs and no pockets, keeps the Bonatti weight down (160grams) and makes it readily stowable. For those wanting more features, there is the Bonatti jacket at (200grams) and the Bonatti Pro Jacket (194g) which increases the ratings to 20K/20K, as well as being designed to be worn over a pack. Layering is key to keeping warm and not overheating when running in winter. The Fast Wing is a starchy mid layer, that allows the body to breath while holding onto heat when its required. The sleeves feature thumb loops in the cuffs to provide hands greater protection from wind. A deep chest zip offers ventilation. Tights. Don’t knock them till you’ve tried them, you won’t regret slipping a pair on when it’s baltic out. But please, leave shorts over tights for cross fit and gym goers, be proud! On the face of it they look like a standard pair of tights, but you must know they offer postural support to your glutes and thighs, along with compression to your calves. With a draw string to tailor your fit and a handy waist pocket, they’ll support you and your house keys on roads and mountain trails. A lightweight glove for daily training, the Fast Wing’s feature thumb and index finger smart device compatible pads, nose wipe, synthetic leather palm and reflective detailing. Their party piece is the wind cover, which can be folded back into the cuff, giving you a windproof mitt when things get really cold. If you’re like me and run with a hot head in winter, a head band is great way of keeping off the worst without melting. Constructed from a stretch fabric, its a true one size fits all and at 12 grams can be pushed into any pocket when not in use.